The genome sequence of a 24,000-year-old Siberian individual has provided a key piece of the puzzle in the quest for Native American origins. The ancient Siberian demonstrates genomic signatures that are basal to present-day western Eurasians and close to modern Native Americans. This surprising finding has great consequences for our understanding of how and from where ancestral Native Americans descended, and also of the genetic landscape of Eurasia 24,000 years ago. The breakthrough is reported in this week’s Nature (Advance Online Publication) by an international team of scientists, led by the Centre for GeoGenetics at the Natural History Museum of Denmark (University of Copenhagen). The search for Native American ancestors has been focused in northeastern Eurasia. 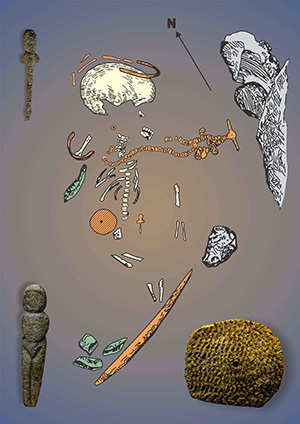 In late 2009, researchers sampled at the Hermitage Museum, St. Petersburg the remains of a juvenile individual (MA-1) from the Upper Palaeolithic site of Mal’ta in south-central Siberia. The MA-1 individual dated to approximately 24,000 years ago. Now, the team reports genomic results from the MA-1 individual which unravel the origins of the First Americans – ancestors of modern-day Native Americans. - Representing the oldest anatomically modern human genome reported thus far, the MA-1 individual has provided us with a unique window into the genetic landscape of Siberia some 24,000 years ago, says Dr. Maanasa Raghavan from the Centre for GeoGenetics and one of the lead authors of the study. 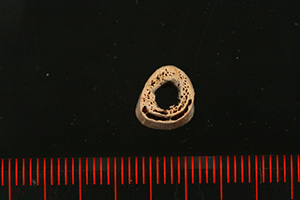 Cross section through the MA-1 individual’s humerus. The central void is the medullary cavity. Credit: Thomas W. Stafford, Jr. Furthermore, the team finds evidence that this genetic affinity between MA-1 and Native Americans is mediated by a gene flow event from MA-1 into the First Americans, which can explain between 14-38% of the ancestry of modern Native Americans, with the remainder of the ancestry being derived from East Asians. Supported by numerous reasons against these signatures being caused by contamination from modern DNA sources or from post-Columbian admixture (post 1492 AD), the study concludes that two distinct Old World populations led to the formation of the First American gene pool: one related to modern-day East Asians, and the other a Siberian Upper Palaeolithic population related to modern-day western Eurasians. - The result came as a complete surprise to us. Who would have thought that present-day Native Americans, who we learned in school derive from East Asians, share recent evolutionary history with contemporary western Eurasians? 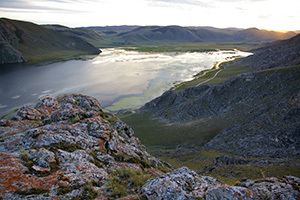 Even more intriguingly, this happened by gene flow from an ancient population that is so far represented only by the MA-1 individual living some 24,000 years ago, says Professor Eske Willerslev from the Centre for GeoGenetics who led the study. Additionally, results from a second south-central Siberian from Afontova Gora-2 site are presented in order to address human occupation of the region during and after the Last Glacial Maximum (LGM; ca. 26,000 to 19,000 years ago), a climatically cold period when glacial ice sheets extended to their maximum range. At approximately 17,000 years ago, this post-LGM individual demonstrates similar genomic signatures as MA-1, with close affinity to modern western Eurasians and Native Americans and none to present-day East Asians. This result indicates that genetic continuity persisted in south-central Siberia throughout this climatically harsh period, which is a significant consideration for the peopling of Beringia, and eventually the Americas some 15,000 years ago. - Most scientists have believed that Native American lineages go back about 14,000 years ago, when the first people crossed Beringia into the New World. Our results provide direct evidence that some of the ancestry that characterizes Native Americans is at least 10,000 years older than that, and was already present in Siberia before the last Ice Age. - Our findings are significant at two levels. First, it shows that Upper Paleolithic Siberians came from a cosmopolitan population of early modern humans that spread out of Africa to Europe and Central and South Asia. Second, Paleoindian skeletons with phenotypic traits atypical of modern-day Native Americans can be explained as having a direct historical connection to Upper Paleolithic Siberia.